Unlike many critics of suburban sprawl who approach the topic from social, environmental, and public health perspectives, Christopher Leinberger comes to the topic with a business perspective. An academic and think tank scholar at Brookings, Leinberger is also a real estate developer. This perspective enables him to identify some of the financial causes of sprawl, and some financial incentives that might help to reverse it. In The Option of Urbanism Leinberger explains financial reasons that sprawl escalated in the 90s. After the savings and loan financial implosion in the 80s, real estate finance was taken over by Wall Street investment firms from failed local and regional banks. To create liquidity in the real estate market, investment banks in the early 90s floated public offerings of Real Estate Investment Trusts which hold portfolios of real estate assets which were worth trillions by the mid-2000s. Faced with the need to scale their operations to finance large volumes of development, analysts created a list of standard “products” that could be evaluated, approved and traded. These “products” include Neighborhood Retail Centers (the ubiquitous shopping mall), Power Centers (malls anchored by big box stores), luxury gated developments, and garden rental apartments visible from freeways. Developments that were “nonconforming” to these cookie-cutter templates were difficult to finance, so developers churned out endless square miles of single use developments that make it impractical to walk, bike, and take transit. Leinberger tells several stories of REIT CEOs who lost their jobs, or passed up more urban development because of concern that nonstandard development would harm their stock price. Leinberger’s business perspective also helps him see the market gap caused by the dominance of sprawl. Repeated market studies show that there is a big gap between the number of people who want to live in walkable neighborhoods near where they work and shop, and the the number of people who have these choices available. A sign of the market demand is the increasing housing prices in walkable urban areas, resulting in displacement of lower-income residents. Leinberger believes that enterprising developers eventually fill the gap between demand and supply. Leinberger sees the greatest interest in financing walkable urban development in private investment funds free of Wall Street pressure. He believes Wall Street analysis will learn how to evaluate urban options, once they have a track record of financial success. However, it will take decades for the market to catch up and provide enough urban options for people who want them. This perspective is promising, although there are a few things it doesn’t explain. It would be possible to create financial templates to evaluate urban developments as well. However, the templates also require proven store brands, putting small local businesses at a disadvantage, and reinforcing bland sameness everywhere. Leinberger believes that diversity can be added back, but given the financial mechanisms he describes, it isn’t clear how. A related concern that Leinberger doesn’t address is building life cycle diversity. The large investment packages favored by developers and investors result in large developments, with all elements the same age. One of Jane Jacobs’ early insights about urban neighborhoods is that they contain buildings of different ages, supporting a mix of incomes and business types. Large developments age and become run down all at the same time, and if they are rehabbed, they are upgraded all at once also. Leinberger does make the case that it will take several decades to meet the pent up demand for urban spaces – perhaps by that time there will be enough variety of ages at the development level to support diversity. In addition to meeting pent-up customer demand, the book calls out another benefit of walkable urban development. Today’s single-purpose commercial development has a profitable life of only 7-10 years. By contrast, Leinberger argues, walkable urban development has a longer useful life, and is a better match for pension funds, life insurance policies, and retirement funds with long term investment needs. The book calls out another financial drawback of sprawl, this time for local governments. The costs to build roads, sewer, and water systems to serve sprawling suburbs are higher than the costs of serving more compact areas. According to a regional planning study for Salt Lake City, Utah, the metro area would save about 25% in infrastructure costs ($4.5 billion) over 20 years if somewhat more compact development. Historically, however, property taxes, user fees, and development impact fees have been assessed per unit, regardless of whether the unit is in suburban areas with one dwelling per acre, as in urban areas with multiple units per acre. 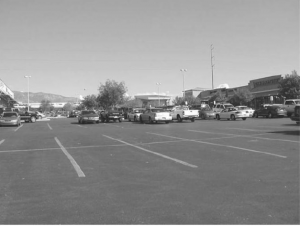 Like many other critics of sprawl, Leinberger also calls out zoning codes that mandate vast parking lots and prohibit mixed use neighborhoods where people can walk to work and to stores. Jurisdictions can update zoning to allow mixed use, greater densities, and efficient use of parking, but there is a long time lag, since zoning codes tend to be updated at a frequency of decades. The picture that emerges from this book is an optimistic one. There is an unmet market demand for urban living, and businesses will evolve to meet the need. There are sources of friction slowing this evolution, including Wall Street investment formulas and zoning codes, but these can evolve over time as well. Over the past 60 years, the pattern of development was very heavily suburban, but the pendulum is starting to swing back.